At Facebook, we believe that hardware and software should be decoupled and evolve independently. We create hardware that can run multiple software options, and we develop software that supports a variety of hardware devices — enabling us to build more efficient, flexible, and scalable infrastructure. By building our data centers with fully open and disaggregated devices, we can upgrade the hardware and software at any time and evolve quickly. We contribute these hardware designs to the Open Compute Project and the Telecom Infra Project, and we open-source many of our software components. We want to share technologies like Wedge 100, Backpack, Voyager, FBOSS, and OpenBMC, because we know that openness and collaboration helps everyone move faster. This ethos also led us to open a lab space for companies to validate their software on open hardware, which can help smaller companies without resources to develop custom solutions choose the hardware and software that work best for them. We’ve seen a lot of traction over the past five months, and there are now more options at every layer of the stack. Choice at every layer of the stack, from the forwarding ASIC up to the northbound APIs. Several companies have announced new solutions that exist around these open networking technologies. Cumulus Networks announced that the Cumulus Linux network operating system fully supports Backpack and Wedge 100. With their system, they aim to make networking more user-friendly and accessible to operators of all engineering backgrounds. Their solution provides flexibility in the provisioning and operation of the networking devices and offers the necessary mechanisms for programmability and continuous automation. The Open Network Linux (ONL) ecosystem continues to grow rapidly. Big Switch Networks announced the release of a fully functional network operating system for Wedge 40 and Wedge 100, based on ONL, OpenNSL, and FBOSS. The inclusion of OpenNSL opens up programmability for switch software developers by making the open API for Broadcom chipsets easily accessible for those interested in ONL/FBOSS. Big Switch Networks also released a new tool to the open networking community: A Docker image that allows for recent releases of FBOSS to be easily built. These releases can be run on Open Network Linux or other network operating system bases. Additionally, Big Switch Networks, with support from Facebook and the OCP community, plans to extend ONL to the Backpack modular switch in the future. Barefoot Networks announced the Wedge 100B series of switches, a new variation of our Wedge 100 platform. There are two switches in this series — a 1RU 32x100GE switch and a 2RU 65x100GE switch. Barefoot Networks took the OCP-contributed Wedge 100 design and modified it to use Tofino, a 6.5 Tb/s Ethernet switch ASIC that is programmable using P4, a programming language that provides the ability to define custom forwarding plane functions. In the process, they also implemented other enhancements, including an optimized power supply unit, updated PCB design, and more. 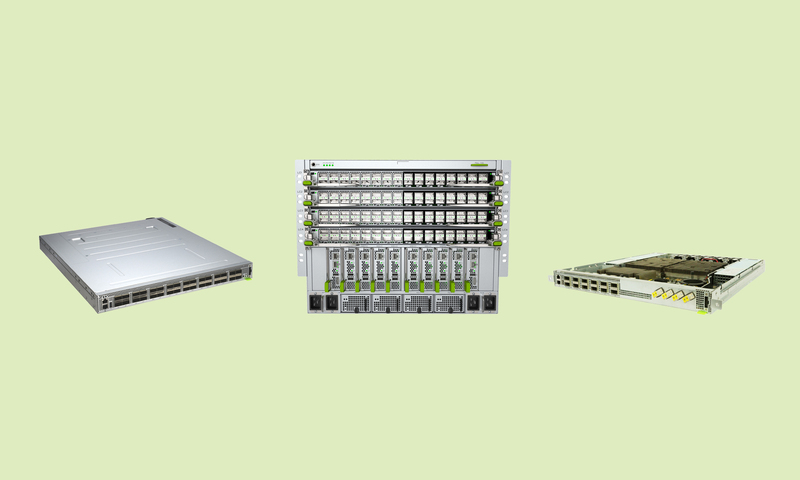 The Wedge 100B switches run an updated version of OpenBMC and they support FBOSS, SONiC, and other network operating systems. Recently, SnapRoute announced the availability of its FlexSwitch software, a micro-services oriented network operating system, on top of the Wedge 100 platform. The same software also powers Voyager, our open optical transponder, providing a Layer-1, Layer-2, Layer-3 and management stack, as well as a complete set of APIs to program and automate the converged packet/optical system. SnapRoute intends to also support Backpack as another hardware platform. Canonical announced their official support of Wedge 100 on Ubuntu Core 16, the latest version of their new operating system for cloud and IoT devices. Ubuntu Core supports a number of different network stacks, including FBOSS and SnapRoute as snaps. It also brings innovative use cases to the top-of-rack switch, such as bare-metal server provisioning and deployment of software like Kubernetes, OpenStack, and Hadoop. Cavium announced a variation of our second-generation top-of-rack switch, Wedge 100C, based on the original Wedge 100 switch specification contributed to the Open Compute Project. The device created by Cavium integrates their XPliant CNX88091 programmable silicon, providing flexibility and new use cases in packet forwarding. Cavium has developed extensions to FBOSS to support the ASIC controls via the Switch Abstraction Interface (SAI), and is in the process of contributing the design of the switch to the Open Compute Foundation. Apstra announced the general availability of the Apstra Operating System™ (AOS)1.1.1, and an integration with Wedge 100. AOS is a vendor-agnostic distributed operating system for the data center network that disaggregates the operational plane from the underlying vendor network operating system and hardware. This is one of the first solutions to provide a simplified way to deploy and operate networks running a variety of operating systems on open switches, as well as more traditional vendor gear. In October 2016, we shared that Wedge 100 was available as a commercial product from Edgecore Networks and its channel partners worldwide. As for Backpack, we're thrilled to announce that it will be available later this year as a commercial product from Cumulus Networks and their authorized channel partners. Today, Cumulus is taking pre-orders. More information can be found at https://cumulusnetworks.com/press_releases/detail/20170124-backpack-modular-switch-platform-available-to-order-from-cumulus-networks/. We hope the availability of all this open hardware and the growing software ecosystem will help advance the networking industry even faster.